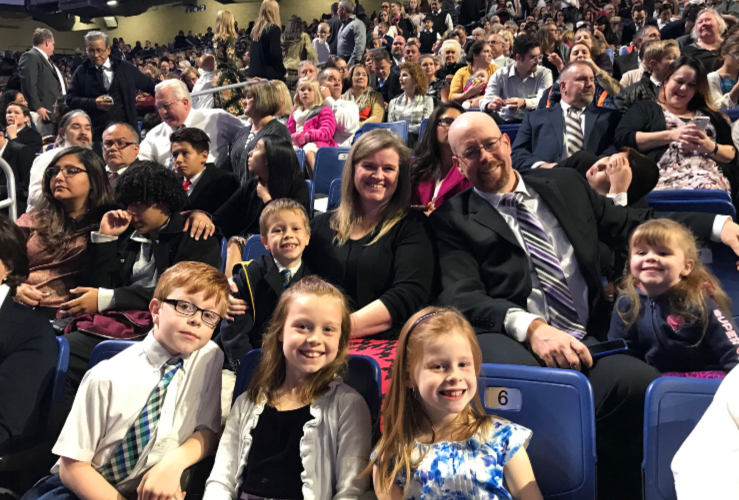 A few months ago, it was announced in sacrament meeting that President Nelson, Elder Bednar, and Elder Ochoa and their wives would be coming to town to do an evening devotional at the Alamodome. 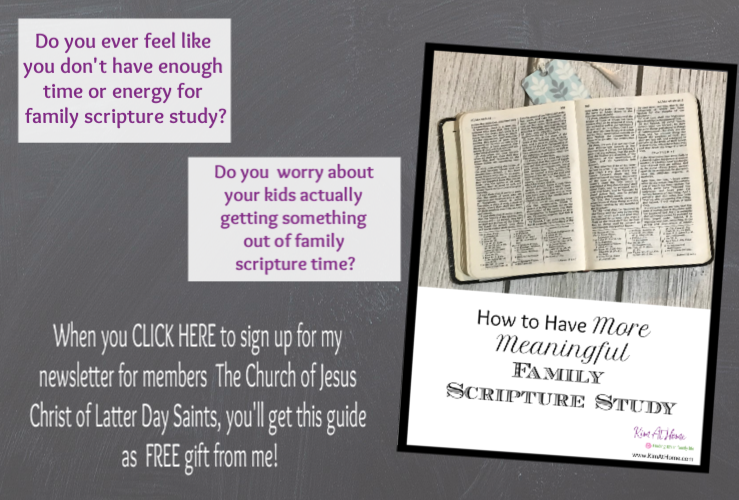 While there wasn’t a big burst of sound following the announcement (it was sacrament meeting, after all), there was a quiet murmur of excitement and you could feel it in the air. What an awesome thing to be a part of! In all my 42 years of life, I had never been in the same room with an apostle, much less the prophet. In the months leading up to the devotional, there was so much planning and preparation. I can’t even imagine what it would’ve been like to be the one to have to arrange everything. Luckily, I wasn’t picked for that job because even the logistics of getting our family with 5 kids there was a challenge. There was a website set up with all the information: parking, timing, what you could bring, etc. There were bag restrictions for the stadium – no just bringing your purse or regular church bag. 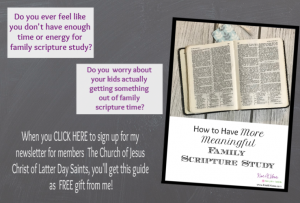 I originally planned to just carry scriptures and notebooks and have all the kids carry their own but then figured we’d need some snacks and other items and thought we’d bring clear gallon bags which were one of the allowed items. The day before the devotional, I decided that I needed actual clear stadium-approved bags and was fortunate enough to find some through Amazon with same day delivery – what a blessing!! Our stake was asked to park in a particular parking lot and they had arranged for a Via Bus (the city bus) to do park and ride for us. My kids were over-the-moon excited for this part! Last year at school, they had a Via Bus come and the kids got to get on and do something. I don’t know what it was all about, just that my little Landon (kindergartner at the time) loved the Via Bus and wanted to go on a moving one so bad since the one at school was just parked. So, his wish came true and the ride from the parking lot to the Alamodome was super exciting! Deciding what to bring for a family of 7 with 5 kids 10 and under was a challenge. The devotional started at 6pm. Everyone was supposed to be seated no later than 5:20 and of course you had to leave home much earlier than that. So, it was at dinner time and time spent sitting in seats waiting for the devotional to start plus during the devotional. I bought new notebooks for all the kids, brought some coloring pages and copies of the Friend, packed some sandwiches on rolls and other snacks and we ate our dinner before we left to the stadium. We had really great seats (because a friend saw us come in and flagged us down to sit in some empty seats near her family), but to get those we arrived at 3:15. That meant 2 hours and 45 minutes of keeping kids relatively quiet BEFORE the meeting even started. By the time the meeting started the little ones were already asking how much longer until it was over! But all in all, they did pretty well. There were about 25,000 people in attendance. Our kids who feel like they’re all alone in their beliefs at school got to see that there are thousands of others just in our area that are members of the church which we thought was a pretty cool thing to see. They were so far away but as President Nelson and the others entered the building, the stadium quieted and everyone stood. I felt this calm settle over me. It wasn’t anything huge but there was this kind of reverent, peaceful excitement that filled the air. I can’t even explain what it felt like, but I can still feel it when I think about it. They took a few minutes to greet those sitting on the stand and wave to the crowd. Brother Ochoa of the Seventy, Elder Bednar, and President Nelson (the prophet) were all there along with their wives. It was really great that all of the wives were on the program as speakers as well. Elder Bednar talked about being “all in” with the gospel. He stressed that a religion that does not require the sacrifice of all things cannot get us eternal life and that sacrifice is what increases our commitment and willingness to obey. We need to not just be willing to die for the gospel but be willing to live for it by devoting our best selves, our time and our talents, and handing over the whole natural self. He stressed that the middle ground options are being removed. The days of living with one foot in the gospel and one foot out are vanishing quickly. We need to press forward and strive to be consistently devoted to Christ. Sister Nelson spoke of the overwhelming peace she felt as President Nelson was sustained during the solemn assembly. She told a lot of experiences that have already been published in articles on lds.org about her testimony of President Nelson being a true prophet. President Nelson spoke of the challenges we all face and that the majority of us are born with, or will acquire during life, a physical challenge of some kind. This was the point where we felt he was talking directly to us as he specifically mentioned allergies (among other challenges). Our 9 year old has been challenged by allergies this year, having to adapt to a dairy allergy in addition to taking regular medication for severe tree and pollen allergies. President Nelson told us that we need to keep an eternal perspective on things that don’t seem fair. If we truly understand who we are and why we’re here then we can withstand the storms of life. He spoke of the hymn “It is Well with My Soul” and read all the words. He said that with the Lord as our exemplar and Redeemer, whatever challenges comes, we will be able to say ” it is well with my soul”. He also emphasized that we need to teach our children what it means to be children of the covenant and that as we do so we can raise a sin resistant generation. The choir then sang, “It is Well with My Soul” after he was finished speaking and I loved how he used the words of the song and then the music to teach us. For me, there were a few aha moments but nothing earth shattering or that I couldn’t have learned by studying Conference talks at home. It would’ve been easier, that’s for sure. But it was a special day to make the sacrifices to be there, to give our children that experience, to sit among such a large group of members of the church, to feel the peace as the prophet of God walked into the room, and to be reminded of those things that are most important to us. I’m so glad we got to be there. As we drove home and asked the kids to share their thoughts, our 9 year old Evie said that her life was now complete because she had seen the prophet. Fast forward to church one week later . 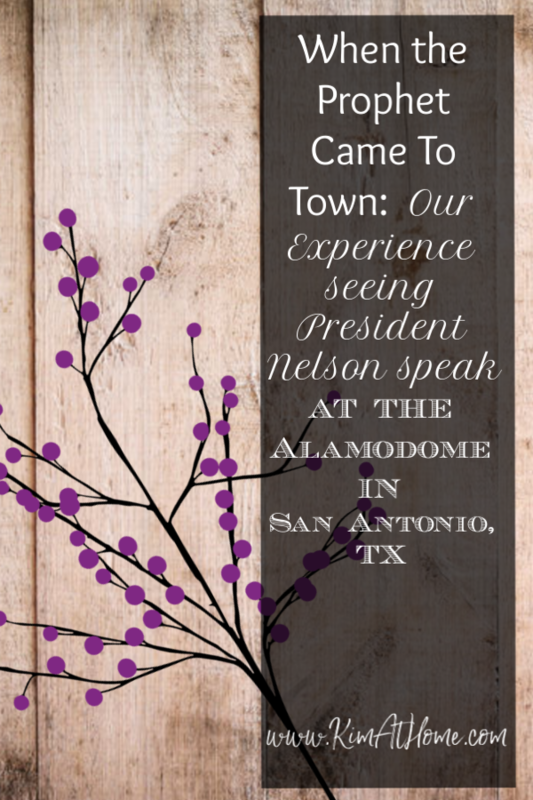 . . we were told that they had taken the pulpit from our primary room to the Alamodome for the prophet to speak at. I had the privilege of standing at that very pulpit to conduct primary and to be able to tell the kids that the pulpit that they share talks, scriptures and prayers from was used for the prophet! That was so special!